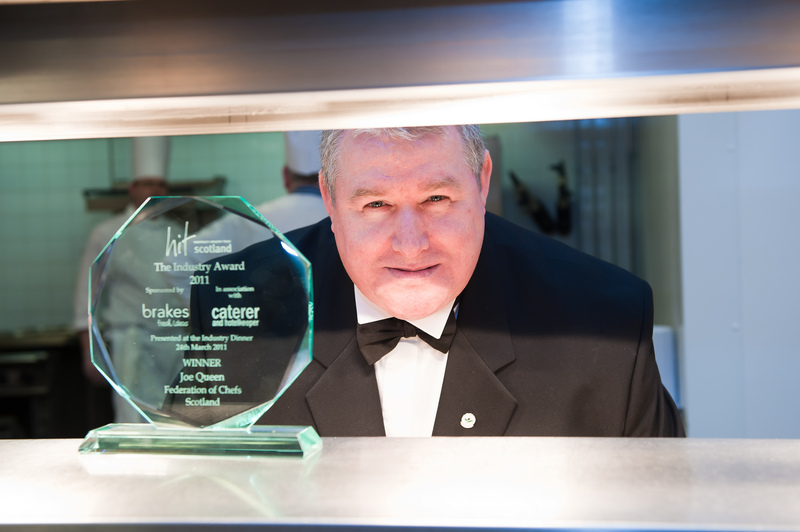 Scottish chef, Joe Queen has received an award for his outstanding contribution to the Scottish hospitality industry at an event on Thursday (24th March 2011) night. Joe received the Hospitality Industry Trust (HIT) Scotland industry award at their annual industry dinner held at the Glasgow Radisson Blu Hotel. The event raised around £44,000 to support HIT Scotland’s scholarship programme. The evening celebrated rising stars in the industry with food prepared by South Lanarkshire and Motherwell College working with the Federation of chefs Scotland’s culinary teams. Chosen by panel of industry experts, the award was given for work as former president of the Federation of Chefs Scotland and mentoring young chefs, many of whom now run their own restaurants. He was also recognised for his involvement with the FutureChef competitions, Scottish Culinary Teams, promoting cooking in schools and his passion for Scottish produce. Based in Glasgow, Joe works as the executive chef for Hilton Hotels. He has previously held executive positions at Thistle Hotels, Macdonald Hotel and worked for Disney in the USA. He has cooked for royalty, prime ministers and has represented Scotland at the Tartan day celebrations in New York. Joe learned that he was receiving the award at the start of the evening. The HIT Scotland lifetime achievement award is presented to someone who goes above and beyond their role to raise standards and aspirations in the industry. Sponsored by industry magazine, Caterer and Hotelkeeper and Brakes Fresh Ideas, the annual award was created to reward and promote role models for the Hospitality industry. Joe Queen joins a previous list of recipients including: Craig Stevenson MD of Braehead Foods, Peter Lederer of Gleneagles and former chair of VisitScotland; Neil Thomson, of Motherwell College and the Federation of Chefs Scotland, Ken McCulloch of Dakota Hotels, Avril Robertson, Peter Taylor, Tony Jackson, Stewart Cameron, Andrew Fairlie, James Thomson, Tony Jackson, Stewart Cameron, David Cochrane, Larbi, Willie Pike and joint winners Eddie Friel and Jack Munro. HIT Scotland is a charity that raises funds to support and encourage excellence in the hospitality industry. The charity also provides scholarships to students and emerging talent already working in the industry. These scholarships place promising people on world class learning experiences at home and abroad. Picture thanks to Simon Williams Photography (for reuse please contact Real PR).